The Rose new commission hits close to home. In the last few years theatre has been expanding its palate. This expansion has given us new voices and stories to experience. In that vein, the Rose Theatre recently commissioned Mary Kathryn Nagle to write a play for children about the story of Chief Standing Bear. Return to Niobrara is the stunning result. It’s a play that entrances both children and adults and is not afraid to address issues that are sometimes ignored in settings for children. Return to Niobrara is a story about Steven who is told he can’t come back to school unless he cuts his hair. It doesn’t seem like an unreasonable request, but Steven is a member of the Ponca tribe and his hair is part of his identity. Asking him to cut his hair is asking him to forsake his identity. It turns out that Steven’s grandfather is Chief Standing Bear and as Steven tries to determine what to do, he is visited in his dreams by his ancestors who help him decide how to fight for equality and justice. He ends up following in his grandfather’s footsteps and refuses to give up his identity for acceptance and conformity. According to the children’s program for this play, Mary Kathryn Nagle was asked to take her adult play Waaxe’s Law about Chief Standing Bear and turn it into something for children. While I have not seen or read Waaxe’s Law, it seems that she has done a decent job of creating a storyline that moves quickly and has some variety to keep kids interested. This version is a great introduction to the story of Chief Standing Bear and his historic win in court. It’s approachable for kids and helps them to see and hear a story outside of the mainstream. It also leaves kids with deeper questions to ask about what makes up identity, what is just and equal, and who gets to make the rules. 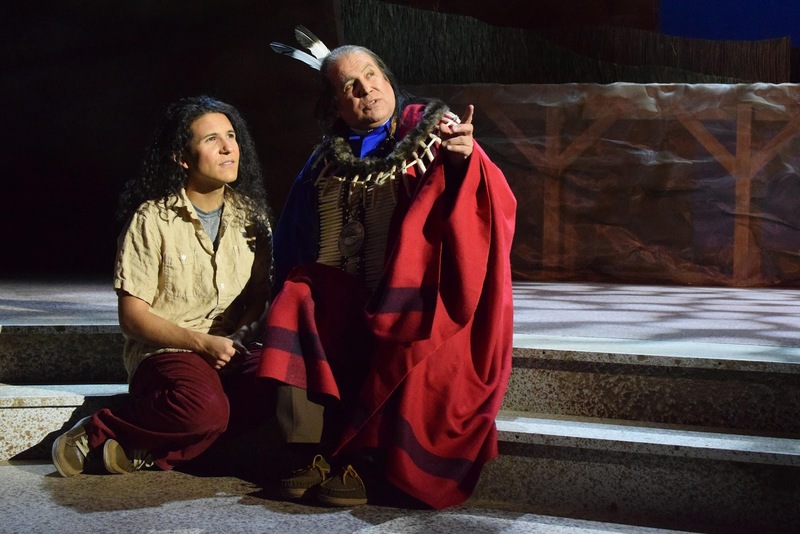 The play is cast with Native American actors, which help lend an authentic feel to the world it is creating. 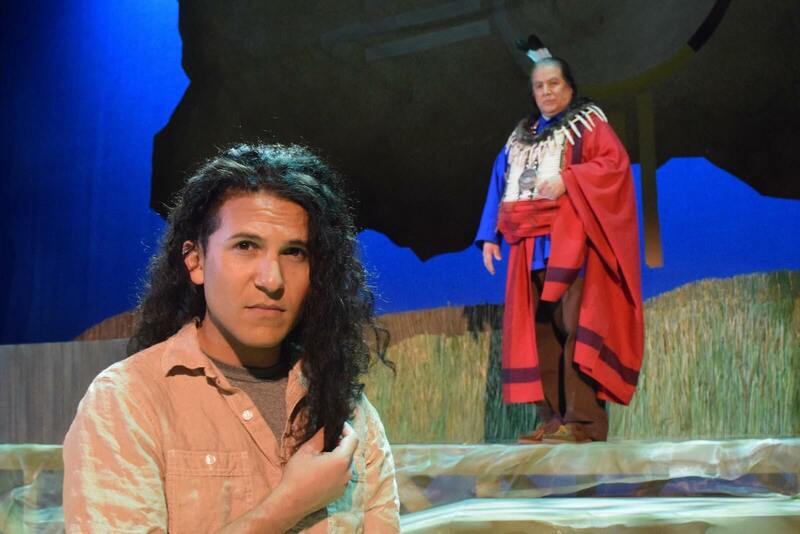 That authentic feel is heightened by the set design that evokes Native American images, and the flute, played by Michael Murphy, between scene transitions. Kenneth Ramos, as Steven/Bear Shield, truly shines in the final court scene, where he confronts who he is and why his identity is so important. This moment is only fully realized with the help of Albert (Abby) Ybarra as Dad/Chief Standing Bear. Together they show their power, their conviction and their strength. Nathalie Standingcloud as Betsy/Praire Flower/Bright Eyes, is a quieter voice in this play, but remains memorable for her portrayal Bright Eyes, the strong and fierce interpreter. She plays a quiet dignity that stops you from questioning her authority. Perhaps the two strongest moments come at the trial when Ybarra speaks the Ponca language, and at the end when he buries his son. A good play needs both the darkness and the light, and these two moments bring that darkness, always hovering just below the surface, to the forefront. Both moments are powerful reminders of a people who have lost their home, their family and much of their way of life. The Rose Theatre has chosen a weighty story to bring to its young audience. This is not a story that glosses over history, portrays stereotypes or makes everyone feel good. It strives to make you a little uncomfortable, in a way that will hopefully make you re-examine the mainstream stories you have always been told. I am grateful to the Rose Theatre for bringing the world premier of Return to Niobrara to Omaha. I feel fortunate to live in a town that embraces new works–especially works that explore different voices and stories.